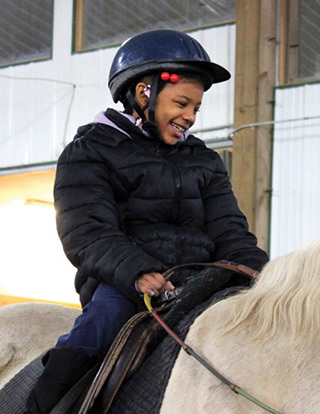 Children from Caledonia Elementary School in East Cleveland have come to Fieldstone Farm to have the opportunity to leave the familiarity of the inner-city and to be exposed to a totally new environment. For many of them, coming to Fieldstone was the first time they had experienced life outside of a city atmosphere. Once they arrived at Fieldstone, they were completely out of their comfort zone. Everything was new to them. The smells, the animals, the open space, and even the people were unfamiliar. This was all part of learning how to confidently adapt to new and different situations. How could they respond to people they had never met before? How could they listen and follow directions? How could they respect the horses and the rules of the barn? These are examples of the life skills that they worked on at Fieldstone, which helped them build confidence and learn skills for future unfamiliar situations. At the end of Caledonia’s eight-week session, the teachers saw many improvements. The students began to walk around the facility with more self-assurance and greater independence and confidence. They felt empowered with their new knowledge of the farm and horses. They responded to their new teachers at Fieldstone with many smiles, good listening skills and high responsiveness to questions and interest in learning. Ultimately, the experience demonstrated to each child that they could successfully adapt to a new situation that may have been uncomfortable at first. They had a greater belief in themselves when they walked out of the barn doors and an experience that they would remember for a lifetime. This entry was posted in Fieldstone. Bookmark the permalink.